It's been 20 years since the last time THE SOFTIES played in Vancouver! Joining them will be LISA PRANK from Seattle and Vancouver's own KELLARISSA. 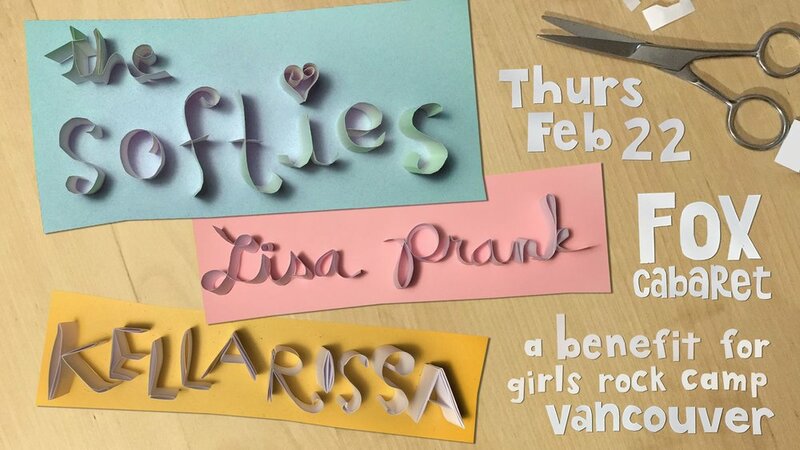 This show is a fundraiser for GIRLS ROCK CAMP VANCOUVER. We will be selling RAFFLE TICKETS and raffling off many tote bags filled with K Records LPs of female fronted bands! Tickets available at Neptoon Records and online via Brown Paper Tickets. The Softies are a Pacific Northwest (via Northern California) musical duo consisting of Rose Melberg and Jen Sbragia. They are known for their minimal approach to pop music. Between the years 1994 - 2000 the Softies released 3 full length albums and two 7”s on K Records and a 10” ep and 7” ep on Slumberland Records. In addition to the Softies and her career as a solo artist, Rose Melberg has performed with many other west coast bands including Tiger Trap, Go Sailor, Brave Irene, Imaginary Pants/Kites at Night, PUPS and Knife Pleats. Jen Sbragia is also known for her work with the bands Pretty Face and All Girl Summer Fun Band. Lisa Prank is an American pop punk band currently based in Seattle, Washington. The band consists of sole founding member Robin Edwards, who performs live with an electric guitar and a Roland MC-505 drum machine. It’s Trapper Keeper punk with a whole lot of hella real feelings. Kellarissa is Larissa Loyva. Swirling loops of voices, synthesizers and other electric sounds. Current member of Fake Tears (Mint). Past member of p:ano, The Choir Practice; touring member of Destroyer & How to Dress Well.